In 1898 2 coaches were delivered as prototypes which oscillated on a 440-metre-long test distance between Zoo and Varresbeck . At the official company beginning new vehicles were purchased in 1900, 26, of it 21 were equipped as a front end and 5 as Behind or Nebenwagen. Per carriage 65 people could be carried. The impulse occurred with direct current motors their achievement 25 kW amounted. Then from 1912 became no single carriages more used, but only 2 carriage trains. Therefore, 5 of the front ends were also altered to Nebenwagen. The carriages were braked by brake shoes, with air pressure were pursued. In addition was under the carriage a tubular air pressure tank which had to become in the termini always filled. 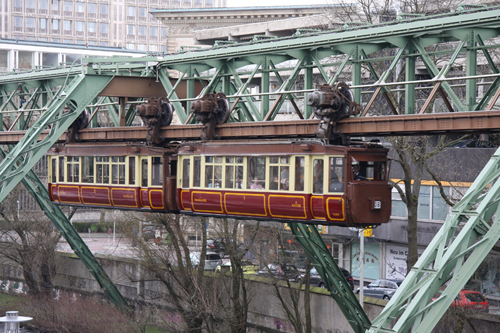 The coaches 05 and 22 were received and restored to the 75-year-old jubilee of the suspension railway. He also operates even today as tourist ones Attraction. In the coach 05 emperor Wilhelm II went together with his wife Auguste Viktoria on the 24th of October, 1900 on the occasion of a visit in Elberfeld and Barmen, therefore, he is also called even today Kaiserwagen . 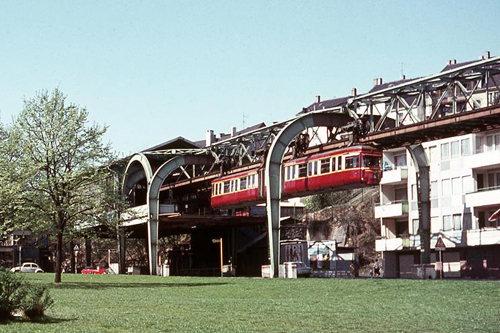 For the opening of the segment Kluse – Oberbarmen other 24 front ends were purchased. These so-called „Barmer coaches “ could also form 3 coach trains. In 1912 were purchased again six coaches. 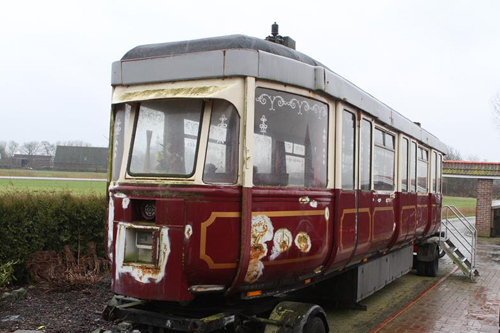 The class 1930 exists only of a train by two carriages, here the wheels were role-stored for the first time, and the doors were driven electric-pneumatically. The Locking was indicated the driver by means of controlling lights. Therefore this train got by with a guard, with the trains, closed doors by hand became, a guard had to go in every coacg. This train had a snail drive and brake a hydraulic so that was dropped one compressed air tank at the terminals . Already during the war one ordered 60 new suspension railway carriages which came, however, only in 1950 to the delivery. 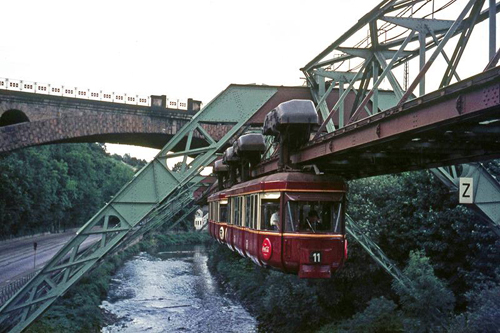 No 60 carriages could be also delivered, but these became only 20. 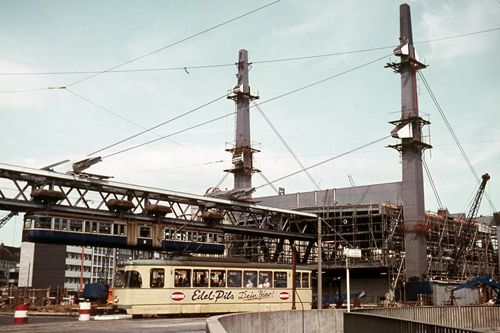 Therefore, the vehicles of the previous classes could not be also taken out of service, but still had to operate till the beginning of the 70s in the control company. The class 50 disposed of the experienced and proven snail impulse. By the use welded instead of riveted carriage box the carriages were also clearly light. For the first time the driver could also explain his activity in the seat. Two single carriages formed in each case a train. As a result of the war the obstructed quality of the materials was not very high, so that the carriages of the class 50 only one a good 20-year-old business hours remained. From the coaches of the class 50 are probably existent another 2 Coaches, the carriage 75 stands still in Solingen and the carriage 62 at the company WE Electronics in Norden . In 1962 the carriages 65 and 66 were altered, they received a middle section more than two joints with the carriage boxes 65 and 66 was connected. Therefore was of her whole train from the front to behind passably. He received the name Tw 101 and was varnished as the only vehicle of this time blue. Quick hatt he his Names away: "Blue gentian". Then in 1965 the second joint train from the carriages 77 and 78 was built. However, he kept a red spraying. 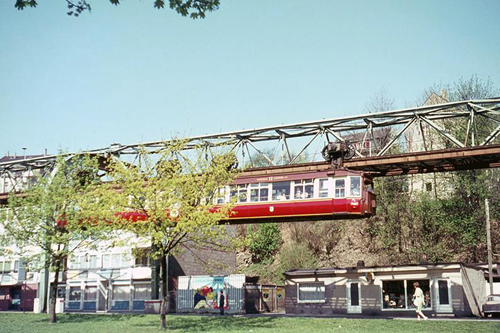 In 1974 both went Joint trains to the technology museum at that time in Bad Oeynhausen.